Racing games are among the most popular in all of mobile gaming. It was the first genre to overcome the lack of physical buttons on smartphones well enough that it made the games worth playing. If you are looking for a fun and addictive racing game for your android smartphone, choosing the perfect one to challenge you while you have fun racing is not easy. Because of that, we looked and we found for you a great challenging and intense racing game. Let’s see what the game is about. What is Bank Heist Escape all about? With the Bank Heist Escape as one addictive and intense racing android game all users will get their chance to challenge their racing skills while enjoying the exciting gameplay and feel like a true racers with every level they pass. On the game, players are offered on screen controls that make the game easy for playing as incredible HD colorful graphics with the amazing racing car for the player. 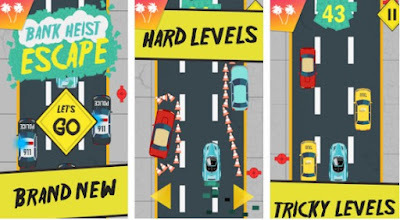 Players need to race as fast as they can and avoid the traffic, racing with the cops and FBI through the whole city, escaping with their car full of cash and getting high scores for their achievements. Multiple different features are offered by this racer game that will get the player addicted fast and keep his attention every time he plays this game. With an amazing background story for the intense gameplay, all the players need to do to win and get high scores is to avoid getting caught by the police and FBI, racing through the city with their car full of cash robbed from the bank. On the way to avoid the cops and escape them, the players need to be careful by using the on screen controls to move the car left or right to avoid hitting other cars on the way. If the player is caught by the police or hits another car while racing, the game will be over. Different tricky levels are offered to challenge the player to acts faster and escape the city full of cash. The ones that race the fastest and avoid the cops full of cash will get the highest scores and become the ultimate races of this game. Download it for free now on Google Play and race to avoid getting caught by the police! 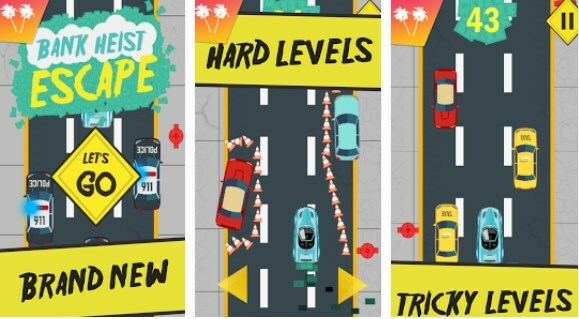 Download it for free now on Google Play and race to avoid getting caught by the police!